Chicago native Big Dipper interviews Bridgeport's own Ed Marszewski and Maria Marszewski at Maria's Packaged Goods & Community Bar for the VICE doc on Halsted Street. CHICAGO — Highlighting a bevy of the neighborhood characters, a new VICE Media documentary takes the world on a tour of Chicago's vibrant neighborhoods that surround Halsted Street. Calling it a thoroughfare that captures "the highs and lows of the city," Chicago native Big Dipper, a rapper who now lives in Brooklyn, interviews a number of Chicagoans in the new 20-minute documentary for VICE. 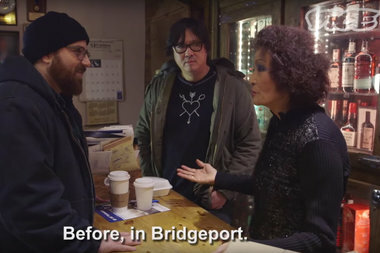 The Halsted tour kicks off in Bridgeport with Marz Brewing's Ed Marszewski, who VICE refers to as "The Dude of Bridgeport," and Ed's mom Maria, namesake of Maria's Packaged Goods & Community Bar, the "Godmother of Bridgeport." Calling the neighborhood ethnically diverse and "the community of the future," Ed Marszewski says that he appreciates Bridgeport residents from all walks of life — "from the young gangbanger to...racist grandpa, to everyone in between." Jim's Original at Maxwell and Halsted, P&G Shoe Shine in Auburn Gresham, Berlin in Boystown, the Altgeld Garden Homes and LPZ Studios, a haven for the music-making Save Money crew in River West, are also featured. Joey Purp, an artist with Save Money Crew, notes that Halsted straddles the city's economic divide. "As you go south of Halsted, the amount of money that someone makes declines. That's where it's a problem," Purp says. Check out the rest of the VICE documentary on Halsted below.